Paulette Frankl- has been an artist all her life. Her first public art exhibit was at the age of seven for the sophisticated Los Angeles art world in a joint show with her father, Austrian born world-renowned Art Deco designer Paul T. Frankl. Frankl’s art combines the visual with the emotional to engender a live force in an original style she calls Perceptualism. As a photo-journalist in Europe, she was a staff photographer for Gruner & Jahr. Her publication credits include Twen, Eltern and a cover and lead article for France’s Réailtés. 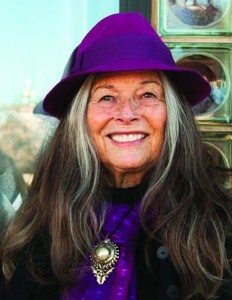 The magazine Geo profiled her lifestyle in California in the seventies. As a performance artist in the field of mime and magic, she was featured on Italian television at Carneval in Venice, and appeared in Sunset Magazine. Frankl worked as a professional magician in the magic capitol of America, Las Vegas, NV. Her courtroom art has been aired on CNN, NBC, ABC, CBS, FOX, WGN-TV and Talk America, and has taken her all the way to the United States Supreme Court. Frankl is a graduate of Stanford University; she holds a BA in art and languages. Aside from being born into a world of art and aesthetics, her only formal artistic study was a one-month summer camp at the Skowhegan School of Painting and Sculpture in Skowhegan, Maine where her work won honorable mention for originality. Frankl currently resides in Santa Fe, NM where her art is seeking out the heart of landscapes of the southwest, the soul of pets and the passion of polo.